Our Enterprise is based in Jaipur, India. We are in the Gem and Jewelry business Since Four Generations. K.K. 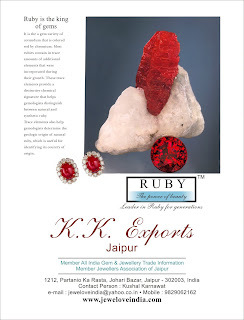 Exports deals in all precious stones and is especially renowned for Ruby worldwide as, The Ruby People. We have cutting facility in our factory at Jaipur, India which offers good cutting and quality work. Our prices are competitive, and our quality is exquisite. We look forward to a chance to serve you.